Take as many courses as you wish. We know you want to learn more about yourself, your history and your heritage. But we also know your busy. Like really busy. So we created a learning system that gives you increased opportunities, decreased workload, quantifiable knowledge and valuable rewards. We created JewishU. 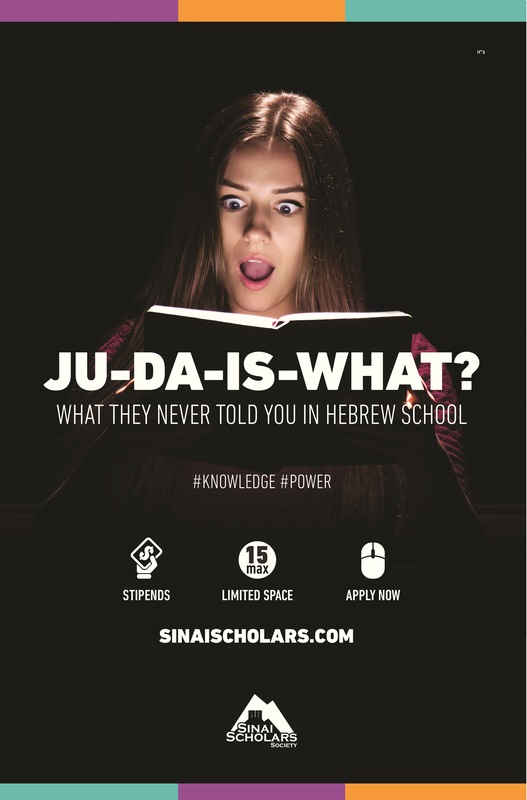 JewishU is an easy, structured and rewarding way to become a more educated Jew. 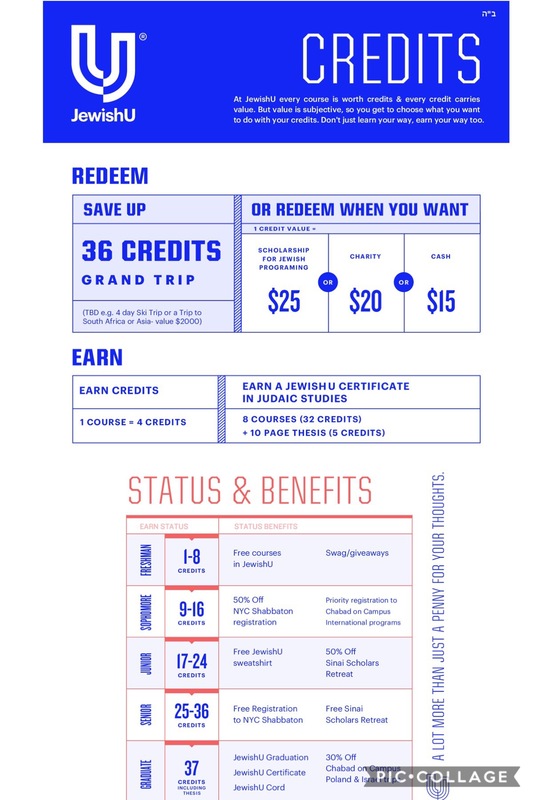 To join JewishU, you sign up just once and then you get to join as many interesting bite size courses that you would like all for free, and you even get to earn credits for the classes you take which can be redeemed for many great rewards! Shut Up and Learn - Thursdays 6-7pm, You’ll schmooze later! This is 45 minutes of no-nonsense Jewish learning in pairs—the ultimate spiritual pre-game for your Thursday night. All levels welcome, beginner to advanced. Click here for more details. Cake, Coffee, Kabbalah - Saturday 10-11am, Enjoy cake and coffee while learning about Kabbalah.Click here for more details. Lunch and Learn - There will be Lunch and Learn sessions at the Law School, the Business School, SAMMY house, ZBT house, AEPI house and of course at Chabad House. Simple Truths - Jewish literacy, Jewish Mysticism - This course on the Twelve Pesukim explores twelve foundational core beliefs and perspectives of Judaism. They are insights that anchor us, empower us, and give us the confidence and know-how to navigate life's most difficult challenges. Soul Maps - Jewish Mysticism - This course provides a distilled overview of the Tanya, a 200-year-old text with a revolutionary look at the human psyche. participants study the source of guilt, conflict, and confusion, and find useful strategies for developing joy, purpose, and direction in everyday life. Judaism Decoded - Jewish Rites and Rituals - This course sheds light on the mysteries surrounding Jewish law and biblical interpretation. What are the origins of Jewish law? How was it preserved? Who is authorized to interpret Jewish law? Why were many laws added in later times? And with so many interpretations to choose from how do we know which one reflects its original intent? Participants get a fascinating, behind-the-scenes glimpse of the backbone of Judaism. The Land and the Spirit - Jewish History - Today, Israel is of the the subject of political debate on college campuses. But, no matter where your students stand politically, The Land and the Spirit will help them appreciate Israel's place in the world and in their hearts. How Success Thinks - Elective- Whether it's at home, in the office, or in your personal life, everyone craves success. This course provides uniquely Jewish ways of thinking to help you develop a growth mindset, identify and cultivate your signature strengths, deal with your weaknesses, and overcome the obstacles to your success. Survival of a Nation - Jewish History- One fateful week in June 1967 redrew the map of the Middle East. Fifty years later, Israel continues to face numerous existential threats. Experience an inspiring and thrilling account of what was then considered the most improbably and astonishing victory in all of military history. Thereby, participants deepen their bond with the land and gain a better understanding of the issues facing Israel today. Great Debates in Jewish History - Jewish History - Discover stirring and surprising accounts that span two millennia of Jewish disputation, reflecting the panorama of Jewish history and its monumental political ethical and spiritual challenges. Encounter the gripping narratives of six fascinating eras, the intellectual tension and points of view they unearth and the light they shed on fundamental Jewish beliefs. Card-Based Social Learning - Jewish Ethics - A social-learning model where groups grapple with case studies and texts, with the option for the instructor to serve more as a moderator than instructor. The topics in this series include the ethics of privacy, forgiveness, relationships with parents, and instances where one perpetrates damage but thereby causes a greater result. Jewish Course of Why - Jewish Literacy - The topics of this course span a diverse range, from fun, light and off-the-beaten-track questions to more complex and controversial issues. Ever wondered why Jews eat gefilte fish and cholent and wish each other mazel tov and lechayim? Why the Bible sanctions slavery and animal sacrifices? What is the cause of antisemitism? Why Jewish ritual is so detail-oriented, or why G‑d created us with negative inclinations? Students will gain insight into mysterious Jewish practices, fascinating glimpses of Jewish history, and enigmas of Jewish identity. Read it In Hebrew Program - Jewish Literacy- Read It in Hebrew is a five-week Hebrew reading crash course. The course builds on the best of Hebrew teaching techniques in an aesthetically-pleasing product that incorporates the educational principles of the Rebbes of Chabad. Alternatively, to sign up for Sinai Scholars Society, click here.